I love my booze. Being pregnant, I miss my booze a lot. I didn't so much the first pregnancy, as I was basking in the joy of being pregnant, but this time around, after a long day of entertaining and chasing around a toddler, I would kill for a margarita. But instead I am settling for non-buzz or relaxation inducing beverages of the non-alcoholic kind. I don't want to drink too much caffeine, nor do I want to drink a lot of soda or carbonated beverages (the gas is already at a higher frequency than usual, I don't need to encourage it) so I have limited choices. A few months ago at a dinner out I was introduced to my saving grace - the non-acoholic Mojito, or what my husband calls the Faux-Jito. Take half a lime, cut into thirds, and squeeze into a glass. Leave the limes in the glass after squeezing. 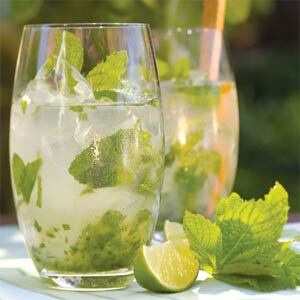 Then take about 4-5 leaves of fresh mint (which I happen to be growing in an herb garden with M) and place in same glass. Then put one packet of Truvia (or sweetener of your choice) in the glass, and muddle that all together with a muddler, or other tool that can smush that all together. Add ice and water and shake (this can be made in a martini shaker, or just put another glass on top and shake)! If you want some carbonation, add some lemon or lime seltzer to the top (after shaking of course - I have made that mistake before). It tastes just like a mojito, but of course is lacking the best ingredient...the booze. I will take whatever I can these days, and these make me feel like I am having a cocktail, without all the guilt!